Laugh lines, parentheses, marionette lines. No matter what you call them, as you age, you may develop wrinkles and folds around your mouth that can be disconcerting. Plastic + Hand surgeons offer Juvéderm® XC to help instantly erase facial lines and folds with beautiful, lasting results. Juvéderm® XC is considered a “next generation” breakthrough in anti-aging treatment. Made from natural products, Juvéderm® XC is gently eased under the skin to restore skin volume, smooth away wrinkles, and bring sunken skin back to the surface. Its ingredients make injection more comfortable both during and after. Plastic + Hand plastic surgeons are experts in facial aesthetics and have the depth of experience necessary to provide the results you’ll love – with the respect you deserve. Juvéderm XC is a dermal filler made of hyaluronic acid (HA), a naturally occurring compound that exists in a liquid form. Cross-linking makes it a gel ideal for anti-aging treatment. HA is one of the major components of the dermis, along with collagen and elastin. HA retains water like a sponge to keep your skin firm and healthy. Through age and exposure to the sun, your cells gradually lose their HA, which dehydrates your skin and decreases its volume, causing folds and wrinkles to form. Juvéderm® XC temporarily replaces lost HA with its own natural HA formulation. FDA-approved, Juvéderm®XC rejuvenates your skin naturally without using animal products. Correcting facial lines and folds with Juvéderm® XC is a quick in-office procedure at Plastic + Hand. One of our experienced plastic surgeons gently injects Juvéderm® XC into the dermis using an ultra-fine needle. Because of its smooth consistency, Juvéderm® XC flows easily into the skin. This minimizes the discomfort that can sometimes occur with injectable treatments and creates a noticeably smoother, more natural look than other formulations. 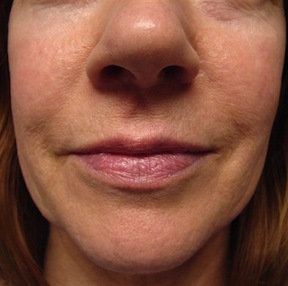 You’ll see results immediately after your Juvéderm® XC procedure. And because there’s no downtime, you can be back to your regular routine right away. One of the most remarkable things about Juvéderm® XC is how long it lasts. You can expect to enjoy the results for six months or more, even up to a year! There may be a little redness, bruising, and minor discomfort right after your procedure. Any side effects you experience are generally mild and of short duration. The formulation of Juvéderm® XC makes the injection even more comfortable for you. Who should consider Juvéderm® XC? If you are unhappy about lines and folds on your face and want a younger, smoother complexion, there’s every reason to consider Juvéderm® XC injectable gel treatments. The procedure is quick, minimally invasive, with no downtime. And, with Juvéderm® XC, you enjoy instant results that last up to a year. Each and every patient is unique. 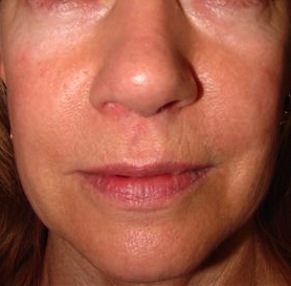 It’s important to us that we listen to our patients from the outset, so a consultation is the first step in determining whether Juvederm® XC is appropriate for you. 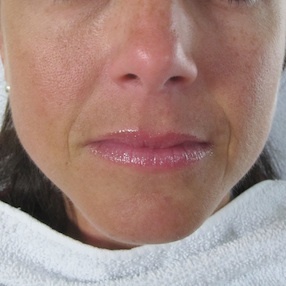 Consultation and Juvederm® XC injections can take place during the same appointment. When your consult and injections take place on the same day, the consult fee of $50 is waived. 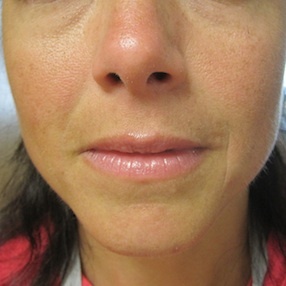 A 55 year old woman desired Juvéderm to improve the smile lines between her nose and lips, and the “marionette” lines below the corners of her mouth.